As Star Trek: The Next Generation celebrates its 25th anniversary this week, many fans may be wondering if we’ll ever see a new Trek series on television. 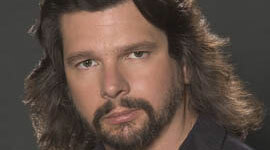 Former Next Generation writer Ron Moore, who got his start with the franchise, says that he believes a new TV series will happen at some point. Moore tells Trek News that while the film franchise does well, it will take a new TV series to really get to the heart of what makes Star Trek, Star Trek. Moore says that the lifeblood of Star Trek is its morality plays. And that while certain episodes have the epic space battles and high stakes for the fate of the universe that we see in the films, it’s the quieter and more philosophical episodes that define what Trek is and has made it endure for a close to fifty years. Moore says that trying to replicate what makes the Trek movies successful would doom any new series to failure. He says that you can’t have the epic space battles and fate of the universe stakes each week and have any new series be faithful to the spirit of what Gene Roddenberry originally created. 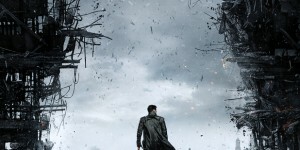 Did Karl Urban Reveal The Next “Trek” Villain?!? Since many sci-fi shows of late rarely last on television (thank you tv execs! 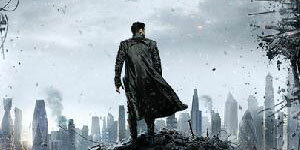 ), I don’t know if a Star Trek series would even be allowed to make it on the air without some bang to draw in viewers. If you are trying to reach a new audience, you are usually focusing on the young viewers. Unless you grew up with Star Trek in some compacity, you would not go into a new series blindly, unless you are a fan already. I do not think they can use existing characters, and which ‘universe canon’ would they use, the original, or the new one created by the movies? If they did not use the new universe, it might just confuse people who started with the new movie(s). If they wanted to use the original, would tv execs let them? No matter what, I am onboard to see more TREK in any capacity. I am elated to hear such words of understanding from someone as close to the Star Trek franchise as Ron Moore. My big fear lately has been that a new series would be what the latest movie was – young adult action adventure with high tech and special effects. The stories that present premises to test one’s philosophy and thinking have always been what attracted me to Star Trek. Well, that and the vision of a “can do” future where man can apply himself to solve nearly any problem. I want to see a new series that Gene Roddenberry would be proud of. Previous post appears lost. Just wanted to whole-heartedly agree with Moore. I watch Star Trek because of the ideas and philosophy at its core and the can-do attitude of the characters. The movie YA action adventure is fine for the movie crowd, but I’d hate to see that as Star Trek tv. I miss the various tv Star Trek incarnations (except perhaps Enterprise), and I’d be disappointed to be relegated to just rewatching the older shows as my sole Star Trek experience. Although I person could do worse, given modern programming. I have to agree with Mr. Moore, but with reservations. Gene Roddenberry sold the series to NBC as an action adventure, then sneaked in the morality dramas anyway. The showrunner, whoever that is, might have to do the same thing. Star Trek: The Next Generation succeeded partly because they were able to bypass the network decision makers and sell the show directly to individual TV stations. Enterprise forgot that lesson and sunk with UPN financial decisions. Would that strategy still work, now that our media attention is so diluted by the internet? You know, I don’t know if Mr. Moore reads this site, but it seems to me if there was ANY ONE SERIES that could pioneer direct to internet, with a pre-pay subscription model, it would be the next incarnation of Star Trek, with Ronald D. Moore at the helm. The fans would never let it die, and the networks could be completely by-passed. It seems a risk worth taking for Paramount. Someone in the know forward this idea to Moore! Of course, SG-1 could probably pull it off as well. It’s an interesting idea to have a new Trek series with Moore at the helm….that said, I’d love to see some fresh blood come in to the Trek franchise.